Have you ever had donuts and kolaches? Chicken and Waffles? It sounds crazy that sweet and savory taste great combined, but sometimes a little from both worlds is all you need to put the cherry on your salted caramel sundae. Here are several delicious food duos that food lovers can’t stop talking about. Order Donuts and Kolaches Now! Aaron Carron of 800 Degrees Pizzaria was a pizza purist until his customers changed his mind. This is probably the most controversial pairing in our list. Some say it brings pizza to a whole new level, while others say it’s a good meal spoiled. News outlet Independent.uk decided to get the bottom of the matter and asked a few chefs for their take on this pizza paradox. To pineapple or not to pineapple? 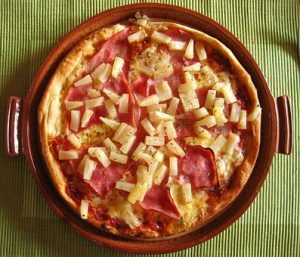 “he instead buys whole, fresh Hawaiian gold pineapples, which are then peeled and diced by hand, tossed with extra virgin olive oil and sea salt, and roasted in their wood-burning ovens until they are caramelized, which actually sounds incredibly delicious.” Now that’s one way to pair sweet and savory. Want Some Sweet and Savory for Your Breakfast? 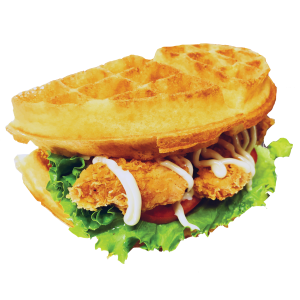 Chicken and waffles became popular because Thomas Jefferson returned from France with a Waffle Iron. You wouldn’t think such a combo would go well together, and yet they do. So well, in fact, that the New York City staple Tick Tock Diner offers them up among the classics, right in the center of their breakfast menu. The exact origins of this dish are unknown. Wikipedia claims its popularity rose in 1789 when Thomas Jefferson returned from France with a waffle iron. In the early 1800’s many Pennsylvanian hotels and resorts served waffles with catfish. They soon switched to fried chicken due to the fishes limited season, a choice history proves to be a good one. The Tick Tock Diner and others show that this chicken and waffle courtship will continue for decades to come. Get Salt and Sweet Today! 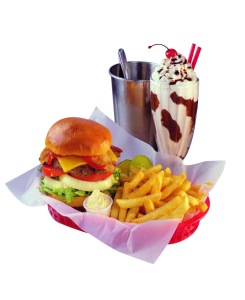 The idea to dip french fries into a milkshake probably came from diners. This pairing sounds like a pregnancy craving. When one man heard his expectant wife say she loved to dunk her fries in her milkshake, he said, “Now I know you’re pregnant.” Yet there are many who dare to dunk and reap the tasty results. Like with our last entry, it’s hard to trace the first person who was brave enough to dip their fries into their shake. Thrillist interviewed Matt Hasting, a professor of chemistry at American University who has a fascination with food fusions such as this. “Finding the first person to do this would pretty much be impossible,” he said, “Really, it’s a diner thing — as soon as people started getting milkshakes and fries together, they probably started doing this.” We salute whoever took that first dunk into the frozen unknown. With your courage, we may have never known how sweet the pairing is. Put A Little Yum in Your Tum! On certain taste buds, receptors move sugar into cells only when salt is present. Ah, donuts and kolaches.The sweet and savory pairings that top them all. Who wouldn’t love the fluffy richness of a donut coupled with the salty goodness of a kolache? That Boston Cream filling oozing onto a piping hot Big Earl.We’re drooling just thinking about it! But did you know there may be a scientific reason salt and sweet pair so well? In a study published in the Proceedings of the National Academy of Sciences, a Monell Chemical Sense Center research team led by led by Dr. Robert Margolskee found the SGLT1 receptor in lab mice. This taste bud receptor moves sugar into cells only when salt is present, hinting that maybe sweet and salt mix well because it’s easier to digest. Unlock the Next Level of Flavor Today! 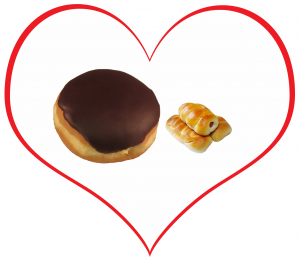 Shipley Do-Nuts has been bringing you the ultimate “opposites attract” combo since 1936. Call (713) 589-3292 or click below to bring your taste buds to the next level today!